• To record the history of the large format movies and the 70mm cinemas as remembered by the people who worked with the films. Both during making and during running the films in projection rooms and as the audience, looking at the curved screen. 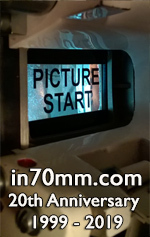 • in70mm.com, a unique internet based magazine, with articles about 70mm cinemas, 70mm people, 70mm films, 70mm sound, 70mm film credits, 70mm history and 70mm technology. Readers and fans of 70mm are always welcome to contribute. Extracts and longer parts of in70mm.com may be reprinted with the written permission from the editor. Copyright © 1800 - 2070. All rights reserved. Two DP70 from the K-B APEX theatre, still operational with all matching conversion kit numbers. They were installed in 1980 for "The Empire Strikes Back". Two DP70 (?+1674) from the Ontario theatre (Washington DC). Projectors removed. 1674 re-installed at IMAX 3D theatre in Indianapolis, Indiana USA. The Left projector was dropped while being moved from storage to storage. I operated DP70s at the Beltway Plaza, College Park, MD, USA; The Vienna Theater, Vienna, VA, USA; The Backlick Theater, Annandale, VA, USA. There were also 2 DP70s at the Annandale Theater, Annandale, VA, USA. Unfortunately no one thought to get serial numbers back in those days and none of these theaters exist today. I also ran the ones you have listed in Washington, DC at the MacAuthor. The machines came from the Ontario which received the XLs from the MacAuthor. Neither theater had any downtime due to the prep work on sound and electrics. Two DP70. "Oklahoma!" opened in November 1956. DP70 removed when 3-strip Cinerama was installed 1962-1964. Single sheet Cinerama curve screen. 3-strip equipment and louvred screen removed 1995. Current screen is "one sheet," but it follows the "Cinerama curve." 1300 seats. Century Cineramas projectors are now the machines and have been the main projectors since "It's a Mad, Mad, Mad, Mad, World" opened in 1963. Projectors went to the Cinema 7 in Bailey's Cross Roads, VA.
Two DP70 (880+881) Opened 05.11.1953 as 6th 3-strip Cinerama theatre. 70mm from late 1959. 1444 seats. Now performing arts centre as of 1991.